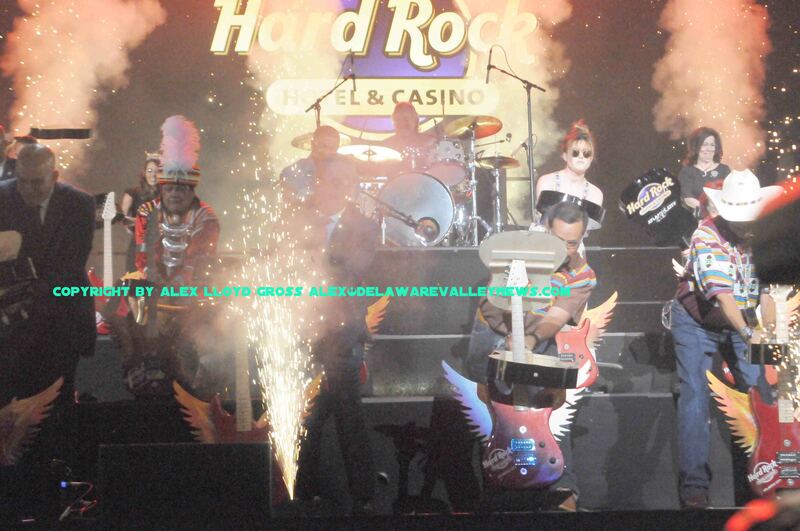 Alex Lloyd Gross- photo- Delaware Valley News.com The guitar smash opens the casino, at the Hard Rock. With the economy in the toilet, casino’s were closing at a record pace. A $2, Billion structure, called the Revel closed within a few years after opening, it’s owners unable to stop the hemorrhaging of money. Donald Trump, once a respected name in the gaming industry closed his entire stake in Atlantic City before he considered a run for the presidency. It seemed like an act of lunacy to open a casino on the boardwalk. Let alone rehab one of the largest buildings on the boardwalk. Yet, that is exactly what the Hard Rock Casino has done. The spent half a billion bucks to rehab and renovate the old Trump Taj Mahal. . You may remember, that building was the largest casino in Atlantic City for a while. It was also the building that caused Donald Trump to go into bankruptcy and it was also the building that a lot of contractors who built it got stiffed by Trump.. The polar opposite happened with The Hard Rock. They used their own cash, there is no debt. They paid all of the contractors and have not a had a labor dispute. They have not had one serious problem with any of the unions. Today, June 28, 2018, the casino was open for business. They had an obligatory ribbon cutting. then at 11:30 AM, a bunch of speeches. As with anything this big, those responsible for getting it done are asked to thank people. So, for an hour, people in the Mark Etess arena sat through people doing just that. The audience were getting restless. They are not in the casino business, they want to see fireworks, pretty girls and fun stuff. After about an hour, those people that gave little talks were invited on stage to smash acoustic guitars. Fireworks, smoke a confetti filled the room. It was done. People that attended concerts in the Taj Mahal remember the arena. 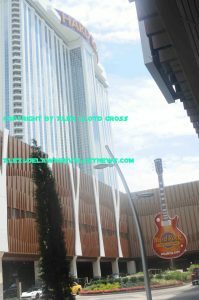 It has since been rehabbed and Hard Rock CEO Jim Allen worked in the Trump organization. He worked with Etess, who was killed in a helicopter crash. He kept the name of the arena. The Hard Rock wants to pride themselves on food. Allen said the Taj Mahal served Frozen steaks and hamburgers were like hockey pucks. “We are not in the hockey puck business,” he said.